The total number of persons newly received by public prosecutors offices was 1,700,796 in 2008, down by 194,768 persons (10.3%) from the previous year. The total number of newly received persons for penal code offenses had been increasing since 1998, but turned to a decreasing trend in 2005, and was 1,059,052 persons in 2008 (down 94,789 or 8.2% from the previous year). As for special act offenses the number has been on a decreasing trend since 2000 and was 641,744 persons (down 99,979 or 13.5% (id.)) (Source: Annual Report of Statistics on Prosecution). Fig. 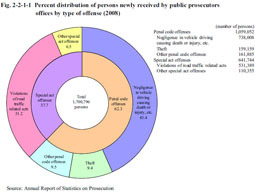 2-2-1-1 shows the percent distribution of persons newly received by public prosecutors offices in 2008 by type of offense. Examining the number of persons received for penal code offenses revealed that 321,044 persons (down 25,194 or 7.3% from the previous year) were received for non-traffic penal code offenses and 738,008 persons (down 69,595 or 8.6% (id.)) for negligence in vehicle driving causing death or injury, etc. By type of non-traffic penal code offense the number of persons received for theft was the highest at 159,159 (down 15,378 or 8.8% (id. )), followed by embezzlement (including embezzlement of lost property, etc.) at 34,393 (down 7,098 or 17.1% (id. )), injury at 28,048 (down 2,473 or 8.1% (id. )), and fraud at 18,415 (up 861 or 4.9% (id.)). Examining the number of persons received for special act offenses revealed that 531,389 persons were received for violation of road traffic related acts (down 90,521 or 14.6% (id.)) and 110,355 (down 9,458 or 7.9% (id.)) for special act offenses excluding violations of road traffic related acts (See (Appendix 2-1).